Trouble for some of the biggest names on the European clubbing circuit. In Sheffield, Gatecrasher nightclub (formerly The Republic) burnt down this week. 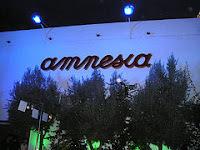 Meanwhile in Ibiza, the authorities have closed down three of the island´s best-known clubs: Bora Bora and Amnesia for one month each; and DC10 for two months, effective immediately. The Government says its actions are a response to reports from local police and Guardia Civil of the use and sale of drugs in these clubs during the 2005/2006 seasons. Drugs in clubs in Ibiza? Surely not! This reminds me of the scene in Casablanca where the police inspector (played by Claude Rains) orders the closure of Rick's Cafe with the words 'I'm shocked, shocked to find that gambling is going on in here'. The Ibiza tourist economy is based around drugs and dancing, but maybe that's the tension that is being played out here: while some factions of the local establishment benefit from this (club owners, mass tourism hotels) others would prefer to reposition Ibiza as more of an elite holiday destination - the argument comes down to 'can we make more money out of a small number of rich people or a large number of poorer people').